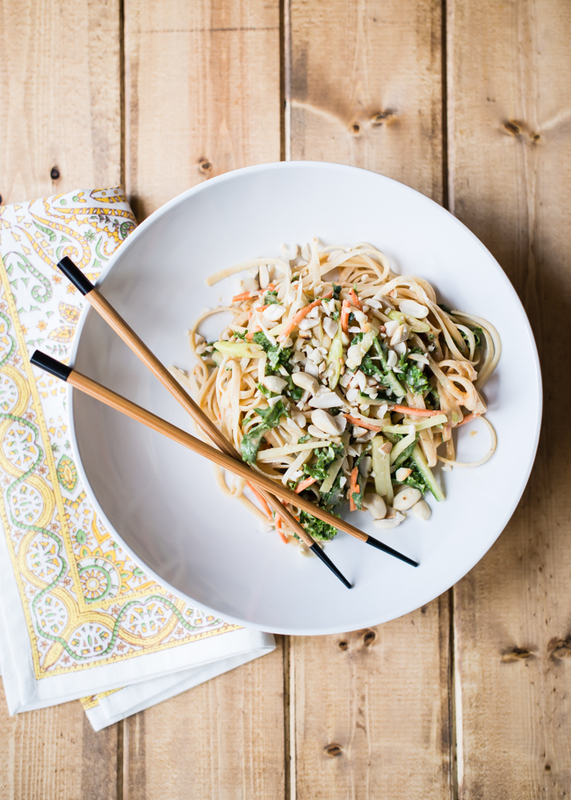 Cold peanut noodles are a staple at my house. We eat them quite often because they are SO easy to put together in about 15 minutes, give or take. I mean, what’s not to love about a quick and easy meal that tastes great? Oh, and did I mention – no oven required! Perfect for a late summer night that feels like you’re in an oven already. 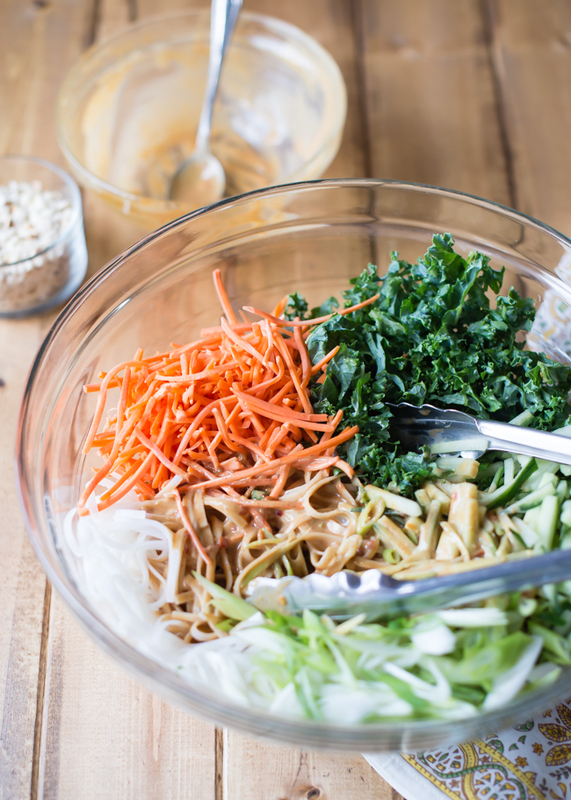 I like to add a lot of raw veggies to the noodles for extra crunch, flavor, and to make it more filling. Any veggies can be used, but I really love adding julienned carrots and cucumber along with chopped raw kale. The sauce has a hint of sweetness and a little spicy kick. They come in several different widths. I’ve used a medium noodle here, thinner or wider noodles are great, too. This recipes calls for 8 ounces of rice noodles; take note of the size on the package because they come in several different sizes. The trick with the noodles is to let them soak just long enough to soften, but not too long for them to become mushy. It takes a little practice, but I always err on the side of firm vs. too soft. Test after 10 minutes, then soak longer if needed. From there, everything gets tossed in a big bowl and dinner is ready in a flash. The sauce itself is a pretty traditional peanut sauce. It might seem like a lot of sauce, but remember that all those fresh, crunchy veggies are in the mix, too. And if peanut butter isn’t your thing, swap it for sunflower or almond butter—even tahini will work great. For an extra spicy sauce, just add more chili paste. 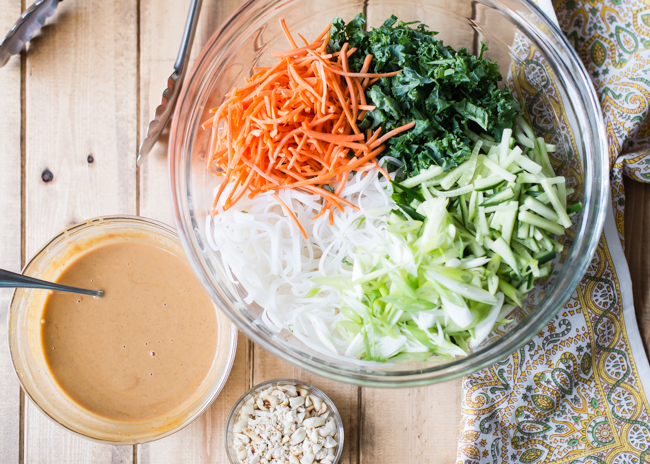 A very fast and easy cold noodle dish loaded up with healthy fresh veggies and a flavorful sweet and spicy peanut sauce. 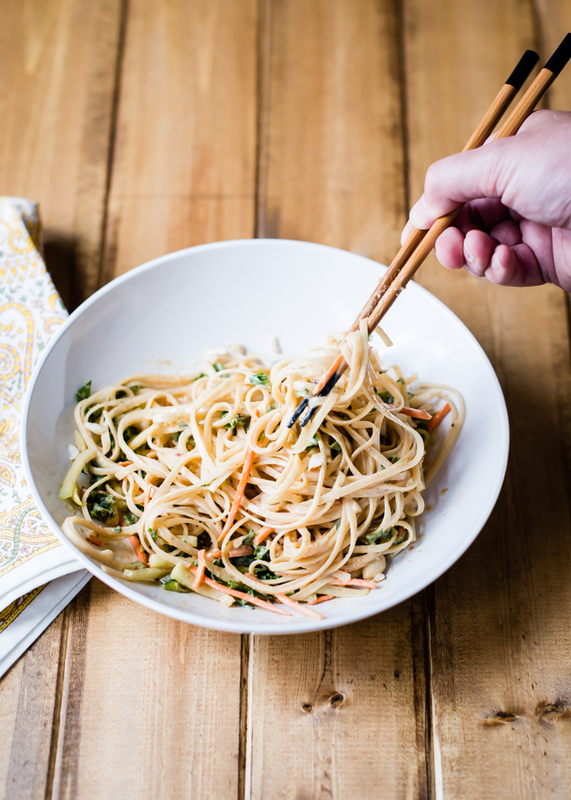 Place rice noodles in a wide, deep bowl. Pour the very hot water over the noodles and let stand for about 8-10 minutes, depending on the width of the noodles. (Refer to package directions, if needed.) Taste to see that they have softened enough - they should be al dente. Drain in a colander and rinse with cold water. Place noodles back in bowl and add the veggies. Pour the sauce over the noodles and toss to coat. Sprinkle with peanuts. Chill until ready to serve, or serve immediately.